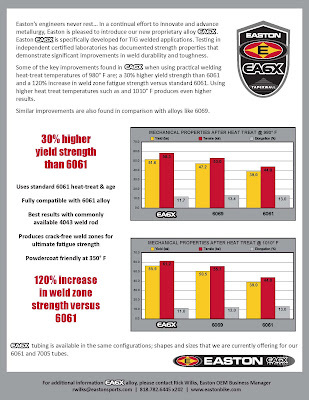 Easton is now offering EA6X tubing as an alternative to 7005! What does this mean? It means small frame builders can use high-end aluminum tubing mated to 6061 frame components. Since 6061 is widely used in engineering applications, billet material is affordable, easy to source, easy to machine and TIG weld. Although 7005 is an excellent alloy for bicycle applications, billet material is difficult to procure and somewhat expensive. Stay tuned for new Ahrens frames using EA6X.